Students will investigate natural elements of this wetland ecosystem by identifying the vegetation in relation to soil type and conducting an animal catch to investigate biodiversity and habitat requirements. Mangrove distribution will be discussed on a global, national and local scale. Land use in the area will be investigated with particular emphasis on the related impacts and management strategies. Students will also calculate the level of removal of mangroves using parallax wedges and discuss the implications of this reduction for ecosystem functioning. Students will investigate human impacts on and reduction of rainforests in the Wollongong area by identifying weeds, using maps & parallax wedges and assessing management practices. The comparison of an open forest and a rainforest will include measurement of soil moisture & pH, humidity, foliage cover and tree identification. Students will also classify the type of rainforest they are studying, construct a rainforest structure profile and examine nutrient recycling through a leaf litter study. forest ecosystem and construct a topographic profile of the study area. Australia has the largest areas of temperate evergreen broad-leafed forests in the world. The distribution of lotic ecosystems will be discussed and the water quality of two creeks will be investigated by testing turbidity, water pH and phosphate levels. Examination of the temperate forest characteristics will include tree identification, slope angle and soil pH. These results will be lead to discussion about natural and human impacts on the forest and existing management strategies. 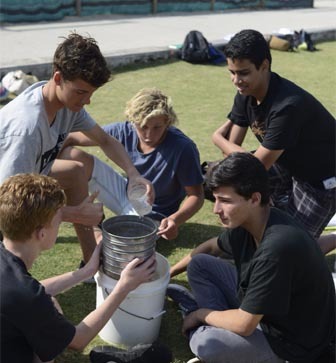 Students identify human impacts on the coast and investigate the elements of this ecosystem that make it susceptible to severe damage from natural coastal processes. Investigations of a natural/re-established sand dune include wind measurements, sand dune sediment analysis and vegetation identification. Students will use historical photos and aerial photos to investigate coastal processes, human impacts and the management strategies designed to deal with these issues.